Isn’t this our call as people of faith? We are to live in the love which has first been shown to us. Reflecting that love to others is what life is all about. If we demonstrate Christ’s love to all those we meet (and the key word here is demonstrate), there are some who won’t understand, but there are others who will not only soak up that love but also share it. Do something wonderful this week. Do something that demonstrates the love that we call Emmanuel. 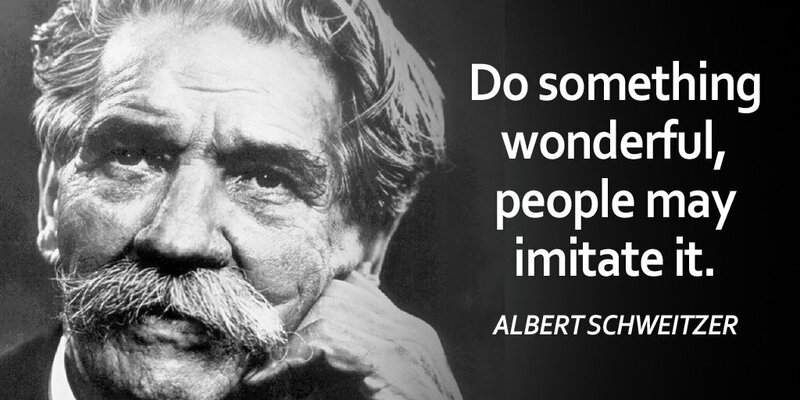 This entry was posted in News & Views, Quotes, Spirituality & Religious Writings and tagged action, Albert Schweitzer, Christ, demonstration, doing, Emanuel, example, faith, imitation, leadership, love, quote, sharing on December 19, 2016 by Ray Buchanan.